Even though Gmail is currently the king of web email providers, a lot of people still use Yahoo Mail. And for those loyal to the latter despite several security lapses, you'll have a few things to celebrate today. That's because Yahoo is bringing a host of new improvements to Mail that includes a cleaner, faster and more intuitive interface and better attachment support. Additionally, Yahoo is replacing its Ad Free Mail service with Yahoo Mail Pro, which is essentially the same thing, but cheaper. 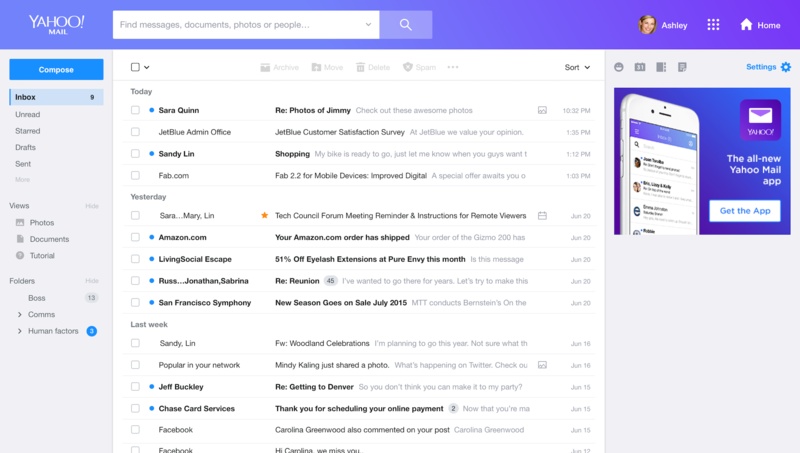 One of the first things you'll notice with the new Yahoo Mail is that it has a much more minimal design. There's more spacing in between UI elements, making for a less cluttered look. Also, you can now finally customize the UI with different color themes and layouts, a feature that's been available on rival Gmail for quite some time. Some themes even have a light and dark mode for different times of day. For those who care about such things, Yahoo Mail also has a new emoji set culled from Twitter's open source library, as well as new stationery options. Another cool thing about the updated Yahoo Mail is a new Photos and Documents view. It lets you see all of the attachments you've ever sent or received, be it a photo or a document, and it'll label them appropriately. You can even preview these attachments in a side-by-side view that lets you look at the documents and the attached email simultaneously. Also, you can get a rich preview of photos and documents by hovering over an image icon in any email that has them. Yahoo also took care to make the whole interface adapt better to different screen sizes and with faster load times, especially for those with slower connections. The settings interface looks better, and the search results are also a lot friendlier than before -- if you have your email view set as conversation mode, your search results will return emails in conversation mode as well (versus a flat message list). The preview pane will sit on either the left or right, depending on your preference. One more big change is that Yahoo is discontinuing its Ad Free Mail product in favor of a whole new plan called Yahoo Mail Pro. Just as with Ad Free Mail, Yahoo Mail Pro will have no ads. It's also cheaper -- while Ad Free Mail was $49.99 a year, Yahoo Mail Pro will cost $34.99 a year. For those who want to go with a monthly option instead, Yahoo Mail Pro is also available for $3.49 a month. There's a mobile-only option that costs $0.99 per month or $9.99 per year, which would require you to download the Yahoo Mail app. Aside from not having any ads, Yahoo also promises that Yahoo Mail Pro customers will have priority customer support. Last but not least, Yahoo has made Mail a lot more accessible to those with low-vision and hard-of-hearing, with better light-sensitivity and VoiceOver screen reader compatibility. There are also layouts with high magnification and full keyboard navigation. Created almost 19 years ago, Yahoo Mail is one of Yahoo's longest-lasting products. It's gone through quite a lot of changes since then as it tries to compete against rivals like Outlook and Gmail. Two years ago, it underwent a huge redesign that bolstered its mobile apps, introduced a password-less login system and, importantly, added third-party email support so that you could use any email address you wanted within the Yahoo Mail interface. Yet, all these improvements were overshadowed by a huge security breach that tarnished its reputation -- so much so that Verizon (Engadget's parent company) even threatened to pull out of its $4.83 billion acquisition. Still, the purchase went through anyway, and it remains to be seen how Yahoo Mail will survive its tenure under Verizon ownership. The new Yahoo Mail will be available starting today, and is opt-in, at least to start. If you decide you don't like it, you can always switch back to "classic" mode in settings.